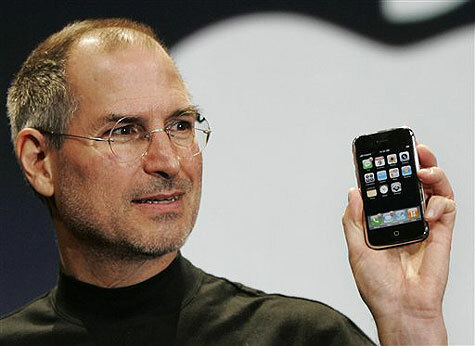 Steve Jobs fragments | PDA-247. Steve Jobs is head of a company tanking most others in many areas…his company makes one of the best selling phones in the history of errrr…phones, head of a business that dominates the mp3 player market, in charge of a company dominating software sales for their smartphone, numero uno of a business where they are bucking the tend and increasing market share in both desktop and laptop sales & establishing a lead in the fledgling tablet department too. You’d think he’d be a happy chap, well perhaps he is but he doesn’t come across as being happy but instead, rather snide and a tad bitter? Why else make these somewhat derogatory comments about the opposition? The problem when you are numero uno and when you are a media darling and apparently can do little wrong in the gadget market is that there is basically nowhere else to go except in the other direction. He should remember where Apple was in the mid 1990’s because it could all go horribly wrong again and if so, he’ll need all the friends he can get in the tech world. Taking cheap pot shots at others who are not quite so dominant is both cheap and totally unnecessary and is not going to endear him to those whom he is currently in competition with. A little dignity would not go amiss here. There’s no need to make comments about RIM because in 3 years time RIM could be Apple. So what if Android is “fragmented”? It doesn’t seem to bother the millions who are currently using Android phones. No, it’s all about choice and sometimes you get the impression that Jobs doesn’t want there to be any choice and that he sees the Apple way as being the only way and he looks down on others who don’t see it the same way as he does. I’ve bought into the Apple thing, the whole eco-system of MacBook Pro/iTunes/iPhone/App Store/iPod because it suits me and what I need from my gadgets, that being mainly simplicity and having all that stuff under the one convenience roof but I just wish that Jobs would be a little more respectful of others. I’ve been using Apple products since 1997, back in the days when they were a relatively small player, when there was no iPhone and no iPod and sometimes I wish it was the same Apple that it was back then instead of this whopping great juggernaut that currently roams and tramples over this gadget earth, at times in a rather arrogant fashion.